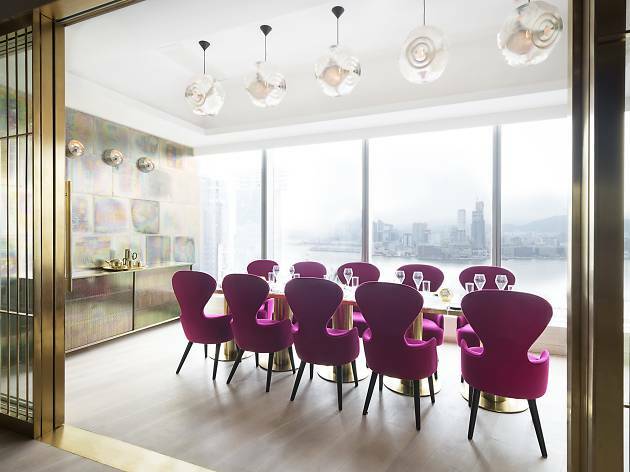 Another new palace of glass and steel has opened in Causeway Bay and we all know what that means – new restaurants! Blazing the trail at the V Point is Alto, Dining Concepts’ latest eatery. Situated opposite the already restaurant-stuffed Soundwill Plaza II – Midtown and above the city’s densest concentration of ramen joints, you would think that Tang Lung Street had ample dining spots. But clearly not. 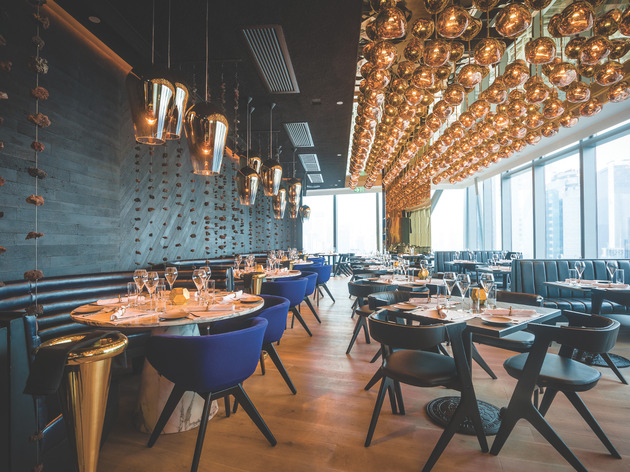 We’re somewhat apprehensive about yet another meat-focused restaurant opening in Hong Kong following the slew of new steakhouses that have started welcoming customers over the last 12 months. And when established classics like Morton’s are supplemented by excellent newcomers like Beefbar, it’s not easy to be impressed given the quality of what’s already available. 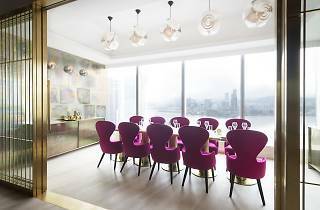 Perched on the 31st floor, the view from this new fine dining establishment is nothing short of stunning. 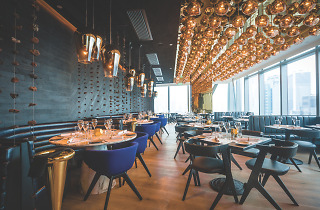 If the ceiling with its rows of mirror ball chandeliers doesn’t give it away, the crumpled brass vases and fruit bowls should clue you in that legendary designer Tom Dixon has had a hand in the decoration. In combination with muted black walls balanced with artfully placed reflective surfaces, the dining area positively glows when light floods in around sunset. The surrounds get a big thumbs up. Alto boasts a grill house menu, populated with all sorts of USDA prime American beef cuts, wagyu steaks and Australian lamb. Also on the menu are a mixed theme of starters and sides, which include foie gras, bone marrow, ahi tuna, fondue and soft-shell crab. First order of the evening is a refreshing watermelon salad ($118). It’s not often you find a salad worth raving about – they’re often deliberately simple – but served with mint leaves, chunks of chilli-roasted feta and accompanied with a thyme and raisin vinaigrette, this dish is summer on a plate. Feta has been known to destroy many a good salad – its pungent saltiness overwhelming all other flavours – but that’s not the case here. Excited to continue with our meal, we’re a little taken aback by the appearance of the foie gras ($178). Served on an almond spiced waffle, the whole thing looks like a burned out mess. Fortunately, the grilled peach and pink pepper help balance the richness of the main ingredients. Though, were the pepper given more prominence it would add a welcome aromatic kick to the dish. For our meat, we choose the hanger steak ($398). The trick to a good hanger steak is never to cook it above medium so we’re glad ours arrives tender and pink. The rich beef aromas of the cut are complimented by some grilled peppers and a dash of salt. That’s all it needs, too. But what impresses most of all is the duck breast ($228). Often a throwaway item to satisfy those shying away from red meat, this steals the show. Apart from its juicy, tender flesh, the skin is pan-fried to a perfect crisp and the underlying layer of fat disintegrates to a palatable sliver. Even the side salad of watercress, beetroot and grapefruit is fresh and fragrant, offsetting the heavy flavours of the duck. Desserts don’t disappoint either. We opt for the cheesecake ($68) and just when we start to wonder why cheesecake needs a hard chocolate casing, we discover the crumbly texture inside. Light as a feather but strong in flavour, this dessert would’ve floated away if not anchored by the cocoa. and what’s already on the market in Hong Kong, that’s no small feat. Not every plate looks like a work of art at Alto but, presentation aside, everything else is far above and beyond your average steakhouse.